This Lebanese salad, known as batenjene raheb, is both beautiful to look at and delicious. Prick the aubergines with a knife. For a smoky flavour, turn them over the flame of the gas hob or under the grill, until the skin is charred and they feel soft when pressed. Otherwise, place them on a foil sheet on an oven tray and roast in the hottest preheated oven for 45-55 minutes until the skins wrinkle and they are soft. When cool, peel off the charred skin and drop into a strainer or small-holed colander. Press out as much of the juices as possible. Chop the flesh and mash it with a wooden spoon, letting the juices escape. Mix the aubergine with the lemon juice, garlic, olive oil, salt, pepper, parsley and mint. Spread the purée on a serving plate. 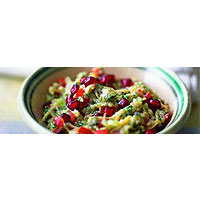 Sprinkle with finely sliced salad onions, diced tomatoes and, if using, the pomegranate seeds.